Along with so many others – students, journalists, writers, and trade unionists – he was arrested in the general round-up that took place in West Pakistan in the wake of the triumph of the United Front in East Pakistan elections of 1954 and Pakistan government’s decision to sign military pacts with the United States. Before his arrest he was acting as general manager of the organ of the Democratic Student Federation, the Students’ Herald. Naseem, who was the editor of the Herald, in a recent communication described to me the occasion of the arrest in the following words. We often hear about the ‘good old days’. Some time there is some truth in this cliché. I wonder if today an ISI (or some other agency’s) officer who has come to arrest two students will have the good manners to let them finish the tea and biscuits they had ordered. Of course people had been locked up without any charges for indefinite periods. But conditions in Karachi Central Jail were reasonably civilised. Detainees were treated as political prisoners (a tradition that had come down from the British Raj) with facilities that were not available to the criminal fraternity. There was plenty of time to read and study. Friends and relatives outside ensured that there was constant supply of books and newspapers. Books published in Moscow, and those with the words and names such as ‘communist’, ‘Marx’, ‘Lenin’ on the cover pages were proscribed but others were no problem. Looking back, I think, most of the inmates would have said that their time inside had been productively spent. One of the books that made rounds was Man Makes Himself: Man’s Progress Through the Ages. Written by the archaeologist Gordon Childe from a Marxist perspective, the book traces the development of man and human society. I mention this book in particular because it was this work which roused Ghalib’s interest in anthropology and led him to Britain to study the subject. Gradually, one by one, on the basis of habeas corpus petitions, political prisoners were released by the Sindh High Court. This entire process took about one year. The democratic movement in Karachi, including the work of the Democratic Student Federation, had suffered a serious setback. Students, Ghalib among them, after release from jail went back to their studies. (Most of these students – other young people too – later distinguished themselves in different professions and made a significant contribution to Pakistan’s social and cultural life.) In due course Ghalib completed his medical studies and as a junior doctor worked in various hospitals in the ‘interior’ of Sindh. Later, he worked on a merchant ship as a doctor, saved money and headed for London to study social anthropology. From now on, while in Britain (he lived there until 2002) Ghalib would work only as an itinerant locum solely to support himself financially. His insatiable search for knowledge had taken him beyond medicine. I did not know of his move to London as I had moved from Karachi to Lahore and had lost touch with him (as with some other Karachi friends). In 1958, days after the imposition of the Ayub martial law , I left my job as a sub-editor in The Pakistan Times, and came to London. It must have been sometime in 1959 that one day while rushing out of a lecture room in University College London I literally ran into Ghalib. Neither of us had known that we were studying at the same institution, I in the department of political economy and he in anthropology. We saw each other often after that, occasionally together taking part in ‘Ban the Bomb’ marches. It was some months later that Ghalib decided to give up his course in anthropology. It was not that he had lost interest in the subject. His main interest had been in the social and evolutionary side of anthropology (the subject matter of Gordon Childe’s book), but in order to study for the degree he had to do a number of other subjects for which he had little taste. Perhaps he thought he had got what he wanted to learn about social anthropology. This had not been a career move – in fact, for Ghalib there was never a career move. He went around the country doing locum work. Now and then I visited him over weekends and thus got to visit and know different parts of England. As I have said Ghalib was nothing if not a seeker after knowledge. In September 1963, after two years of research, I obtained a lectureship in economics at the University of Strathclyde, Glasgow. Ghalib who had just completed his stint as a locum in a hospital in Dartford offered to drive me to Scotland in his recently bought old Hillman. This was before the days of motorways and fast trains. On the way to Glasgow he told me that he would like to study biochemistry. (Something that came to me as a surprise.) That would require a full time course. I was proposing to buy a flat (on mortgage) and get married in a few months time. (My would-be wife knew Ghalib quite well.) I suggested that he stay with us and pursue his study. He made inquiries at Strathclyde University and was able to get admission to a two-year MSc course. After completing his MSc Ghalib went back to England, doing locum work. Later (I do not recall the year) he was able to get a Hungarian government grant to research at a scientific institute in Budapest. (I visited him there, stayed a week and had a great time.) He completed his work there and returned to England. After some time he registered to do a PhD in the field of biochemistry in Sussex University. He completed his PhD and worked for a short time as a researcher in Birkbeck College, London University. He did not do any biochemistry after this. (Did he for a short period go back to Pakistan to teach biochemistry in a university? I am not sure.) Some years later, I think some time during the latter half of the 1990s (again, hazy about the dates), he enrolled to do a degree in mathematics at Middlesex University. I tried to dissuade him from undertaking this project but he went ahead with it. It was tough going but with sheer will power and hard work he went through it. In the second half of 2002 he returned to Pakistan, having decided that there was no point in his continuing to live in England. By the accounts that I was able to get, he lived the life of a recluse, totally immersed in his books. (He never married.) Once speaking to him on the phone I suggested that he could do some medical work but this suggestion did not appeal to him. The brief account I have given of Ghalib’s life shows an acute degree of intellectual restlessness. Until some point in the 1970s (hazy about the dates) Ghalib had adhered to the political standpoint that he had formed in his student days. He was a Marxist, a socialist. I remember that at times he leaned towards rather extreme views. He was, for instance, enthusiastic about Mao’s Cultural Revolution and took pleasure in the idea of intellectuals and writers being sent to work in pig farms. The Great Leap Forward and the resulting famine and loss of human life on a massive scale? Well, to achieve its goal, humanity has to make sacrifices on the way. These are instances of the kind of political standpoint to which Ghalib adhered. To some extent we all tended to take the view that to reach the goal of perfect society sacrifices will have to be made. Soviet industrialisation had entailed enormous sacrifices on the part of the people. How else could progress be made? But Ghalib stood out among us – entertaining absolutely no misgivings. There was a fundamentalist element in his way of thinking – even as a socialist. Ghalib once told me about a painful decision his father, a deeply religious man, had to make about Ghalib’s studies that would determine the course of his future life. This was when a decision had to be made between the choice of science subjects and, what we might call, the ‘humanities’ which included the study of the Arabic language. The father wanted his son to engage with Islamic scholarship. But he was also a forward looking man who realised the importance of studying the sciences. Eventually, after much thought the decision was made in favour of the sciences, perhaps in the hope that the study of Arabic and Islamic scholarship could be pursued on the side or at a later stage. It has been said that no man can emancipate himself from his past even when he rebels against it. Ghalib never rebelled against his past. He never turned his back on religion as many of his fellow students did. Religion – Islam – always remained a powerful influence in his life. It was a powerful tendency that in the earlier stages of his life remained dormant. It was also not always apparent to his friends. This was also because Ghalib avoided external observances and rituals. It is partly this religious factor that lent complexity to his character, a complexity that was noted by all his friends and fellow students in the Democratic Students Federation. It was sometime in the 1970s (again hazy about the dates) that I started to receive communications in the shape of treatises from him. These were sent to others as well – his former research advisor Dr Blaine in Glasgow received the same, something that Dr Blaine said he could not decipher. Dr Hashmi also received them, as recently confirmed by Dr Haroon Ahmad, as did Dr Yousaf Ali. Over the years I received numerous of these recondite compositions and had many occasions in which to discuss their underlying ideas. In these compositions Ghalib had undertaken the Herculean task of reconciling the existence of God and religion with the natural sciences, Marxism and so on. All were united in one thought. At least that was my understanding of what he was saying. Discussions between us were made difficult because the objective of these treatises was never explicitly stated and terms such as God and Islam were studiously avoided. My main difficulty with these compositions was that in them propositions of a positive nature shaded into assertions and value judgments. For him this was a legitimate procedure, for me it was not. At the same time he rejoiced in the progress of scientific knowledge made in the West since the sixteenth century, and bemoaned the fact that since the flowering of scientific thought in the Muslin world in the middle ages Muslims had failed to adequately participate in the advancement of scientific thought. Gradually, in Ghalib’s thought the tendency deriving its inspiration from religion began to gain the upper hand. It is difficult to specify the time of this shift; as I have said this tendency was always there. It surfaced very noticeably after the destruction of the Twin Towers, the 9/11. What this attack, and the reaction to it, achieved was to heighten Muslim consciousness, consciousness of Muslim separateness from the West, of a distinctive Muslim identity. (A significant increase in the wearing of hejab in the UK, that I observe, is an expression of this awareness.) From now his friends observed a distinctive strident note in his discussions. I think he was still committed to the achievement of a society based on justness and rightness, a commitment that in his younger days had led him to socialism and Marx. But he was now seeing the world as being divided between two ideologies, the Muslim and the Western – Us and Them. Let us go back in time, before 9/11: the second half of the 1990s when he was engaged in the Herculean task referred to above.. As all Ghalib’s friends knew he lived a very frugal life – though he was generous to his friends (I would say) to a fault. It must have been around 1997-98 that he told me that he had saved £100,000 for the specific objective of setting up a charity to promote education, and wanted me to undertake the task of setting up such a body. We had long discussions on the Objectives or (for want of a better word) the philosophical basis of the new organisation. In drafting the statement of objectives I tended to use words which suggested the promotion of a secular outlook, religious tolerance, and so on; Ghalib hated the notion of a secular outlook, he thought there was no dividing line between the secular and the religious. At long last we agreed on words that were acceptable to us both. (I should mention here that such a ‘philosophical manifesto’ is not part of the legal requirements for registering a charity in the UK; it was only intended as a general guidance to the trustees of the charity.) We agreed upon the name of the charity – Solas Educational Trust (‘Solas’ is a Gaelic word meaning ‘light’ or ‘enlightenment’) and on the names of the trustees, that included Ghalib and myself (convenor), two friends from the days of the Karachi student movement, Dr Yousaf Ali and Barkat Alam, and two of my colleagues from the University of Strathclyde, Professor Jim Love and Roy Grieve. The charity received recognition from the Board of Inland Revenue in March 2000. It has since been active in supporting a number of schools in Chitral. (The amount of £100,000 is still intact in investments.) The last meeting of the Trustees attended by Ghalib was in May 2002. He left for Pakistan later that year. He had hoped to visit Chitral, but that was not to be. Solas remains Ghalib’s most important legacy. I will propose to the trustees that to celebrate Ghalib’s life, a permanent memorial (for instance, in the form of a school named after him) be established in Chitral. Goodbye, generous friend, earnest and upright, seeker of knowledge! Thank you very much for a very fine article on Dr. Ghalib Lodhi. The last parts of it, especially his transformation in terms of religion, were new to me. I, and all my siblings, used to call him Ghalib MamooN because of his close friendship with our maternal uncle Dr. Manzoor Ahmed before Dr. Ghalib moved to England. 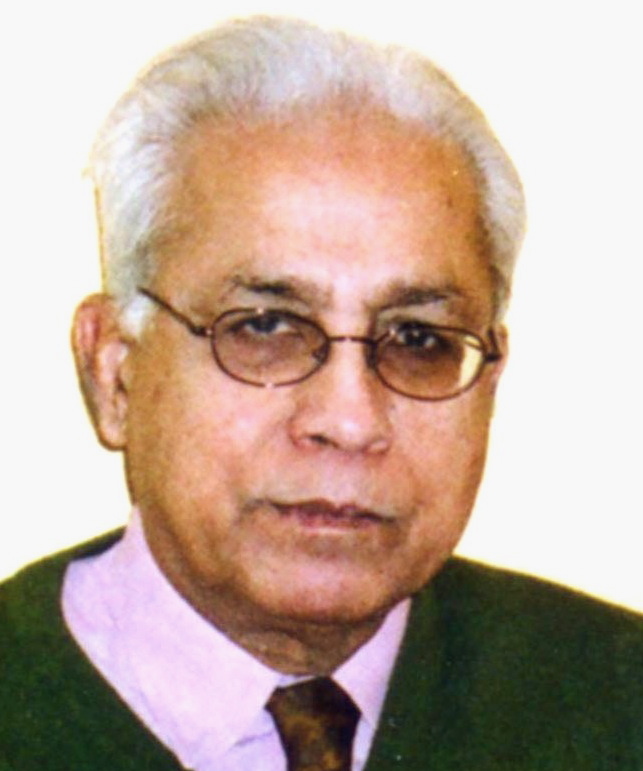 When he returned, Dr. Manzoor Ahmed had been affected by dementia. I am told that Dr. Ghalib regularly visited Dr. Manzoor Ahmed in spite of the latter’s incapacity to recognise anyone, or to hold a meaningful conversation. While a student in London in the late sixties and early seventies, I also became a recipient of his compositions, photocopies of essays hand-written in a beautiful calligraphic style. For a day I was his guest in Bradford, where I witnessed his frugal way of living. So, thank you Eric Rahim saheb for remembering a person really worth remembering. Thank you Eric Rahim Shb and A.H. Nayyar Shb. I spent an year with him at Karachi Prison. In his last days I remain in contact with him. He was a great human being. He was noble soul.We miss him. 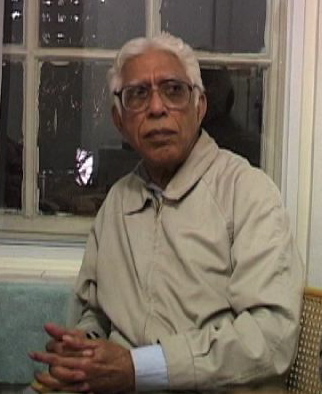 iqbalalavi.